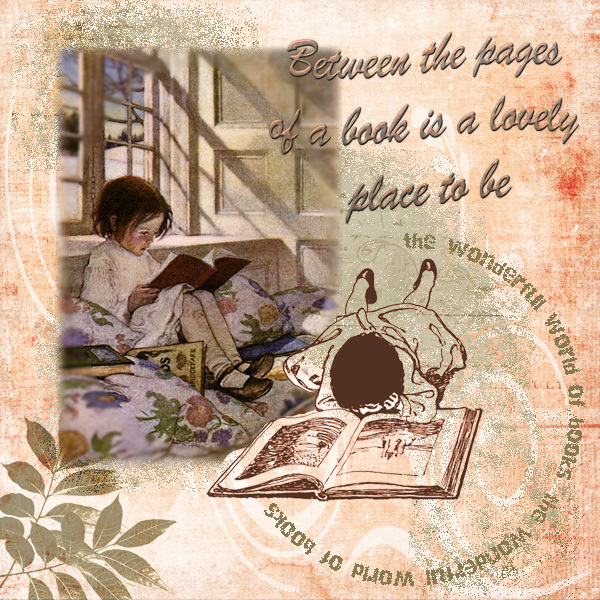 This little journal page was created for the Art for the Creative Mind Yahoo group. 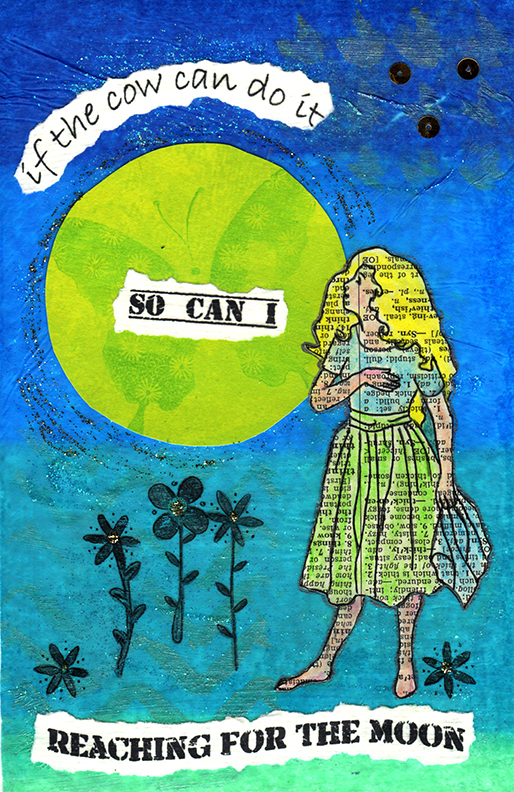 Whimsical Me was the subject and only guideline for this 5 1/2 x 8 1/2 inch page. The background is an ombre tissue paper. Tissue paper is a great way to get a brightly coloured background quickly. I covered it with gel to keep it from bleeding. A simple coating of clear glitter glue went on top of that with some pearlized water paints stenciled into the corners. The green cheese moon is a piece of water colour card. My little girl with the wistful look was traced from a vintage fairytale book using my Wacom Bamboo tablet in PSE 11. I then printed onto a dictionary page and coloured with water colour crayons. Once she was dry I redrew the black lines and outlined her in grey gel pen. The words were printed on a piece of textured resume paper and torn before being pasted onto the piece. Everything was covered with another layer of gel to preserve it. Cats and their attitudes are incredibly funny. These little furry people each have their own singular personalities and want their own way each and every time. If it doesn’t go their own way they will surely let you know immediately. I think cats and summer were made for each other, lolling in the sun and absorbing every ray than can find or chasing sun moats and shadows. I wonder what they are dreaming of? Daisies and hollyhocks? Grasshoppers and crickets? 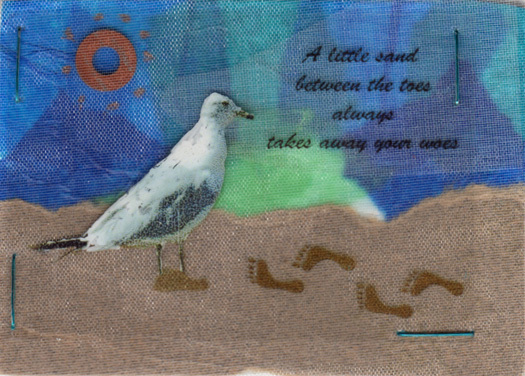 The first little card has a sky made with an ombre tissue paper, torn into pieces, a washer painted copper for the sun. Sandpaper creates the sand and a piece of fine, glittery tulle on top. 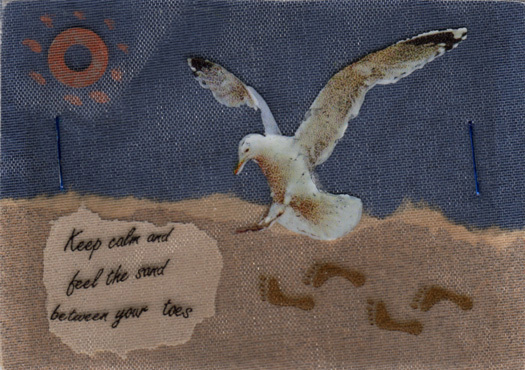 The gull, phrase and footprints were printed onto a piece of transparency and stapled onto the background. This second card has a sky made from denim wallpaper and two different types of sandpaper. I wish I was there putting my footprints in the sand. 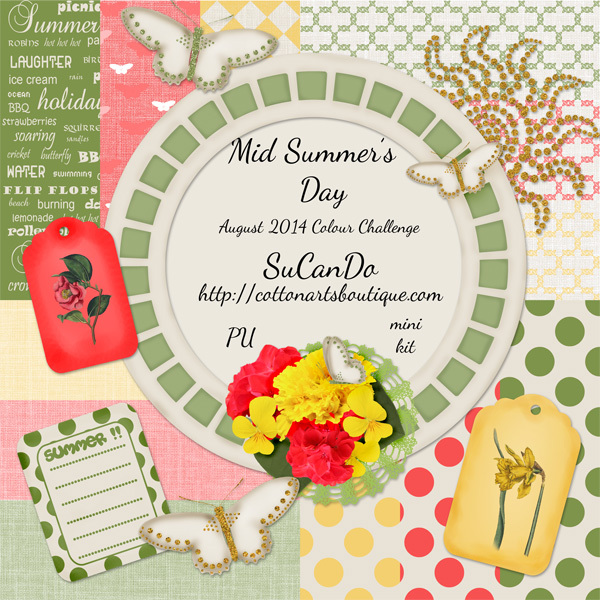 Summer is almost gone !!!!! …. see me crying in the rain …. I know many of you are burning up with the heat but we have had a very rainy, wet and dull summer here in Ottawa. Fortunately there have been a few peeks of sun out now and then. 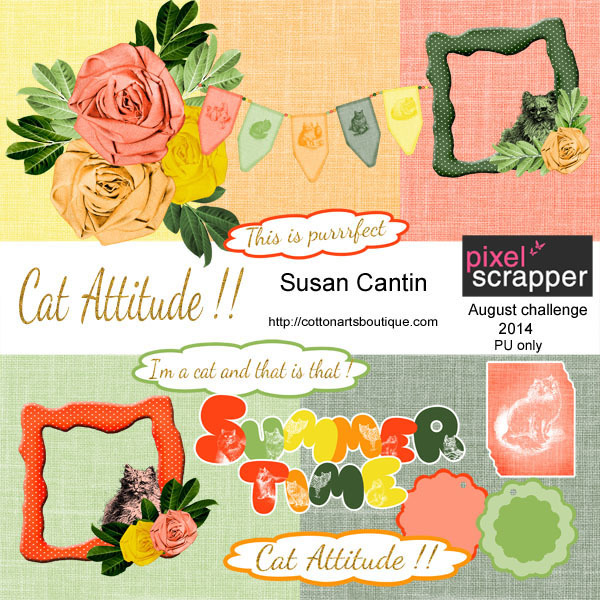 I am celebrating those few days with a bright and sunny mini kit for the Digital Scrapbooking Studio’s August colour challenge. Won’t you join us here. Butterflies, a journal card and two bright tags along with lots of summery papers to put together your summer adventures. Plus I’ve added a pretty frame for your favourite photo and a big glittery sun for all those hot, hot, hot photo days of fun.